(Trent Nelson | The Salt Lake Tribune) The current UTA Board holds its final-ever meeting in Salt Lake City on Thursday Oct. 25, 2018. After scandals, the Legislature restructured the agency. And the current 16-member, part-time board is about to be replaced by a new full-time, three-member commission by Nov. 1. 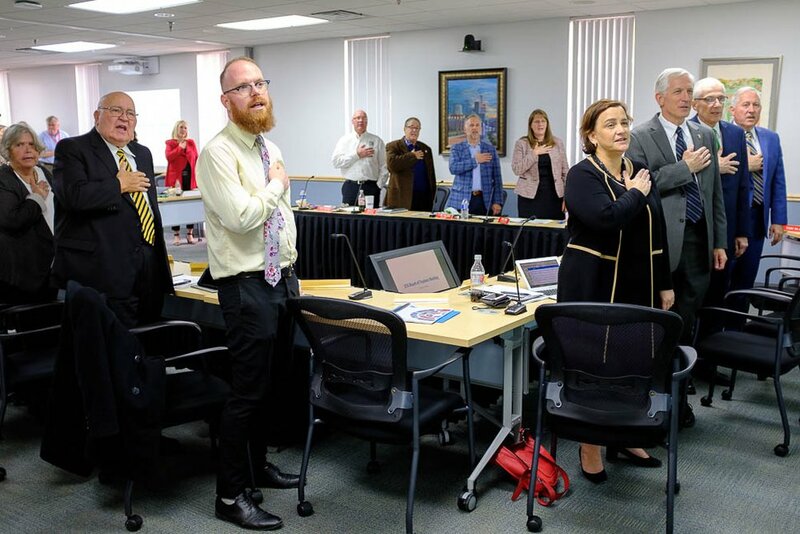 (Trent Nelson | The Salt Lake Tribune) The current UTA Board says the Pledge of Allegiance to begin its final-ever meeting in Salt Lake City on Thursday Oct. 25, 2018. After scandals, the Legislature restructured the agency. And the current 16-member, part-time board is about to be replaced by a new full-time, three-member commission by Nov. 1. 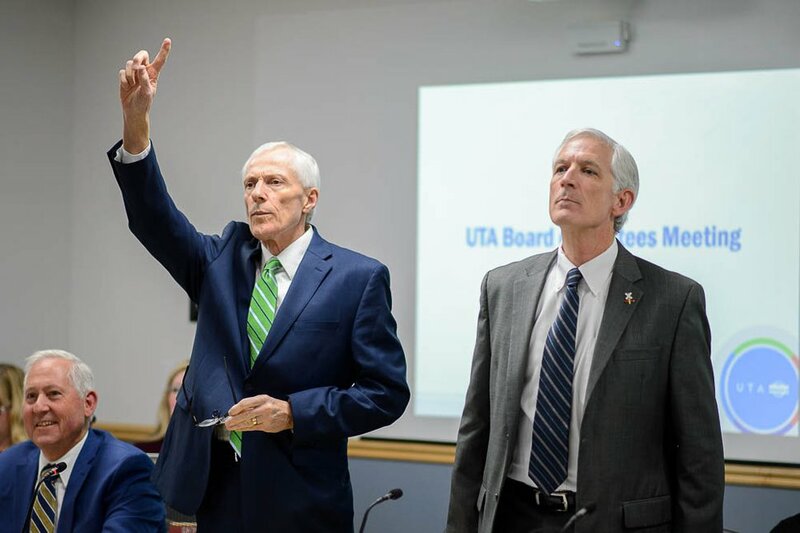 (Trent Nelson | The Salt Lake Tribune) The current UTA Board holds its final-ever meeting in Salt Lake City on Thursday Oct. 25, 2018. After scandals, the Legislature restructured the agency. And the current 16-member, part-time board is about to be replaced by a new full-time, three-member commission by Nov. 1. (Trent Nelson | The Salt Lake Tribune) Board Chair Greg Bell and Interim Executive Director Steve Meyer at the start of the final meeting of the current UTA Board in Salt Lake City on Thursday Oct. 25, 2018. After scandals, the Legislature restructured the agency. And the current 16-member, part-time board is about to be replaced by a new full-time, three-member commission by Nov. 1. At left is Jeff Agerson. 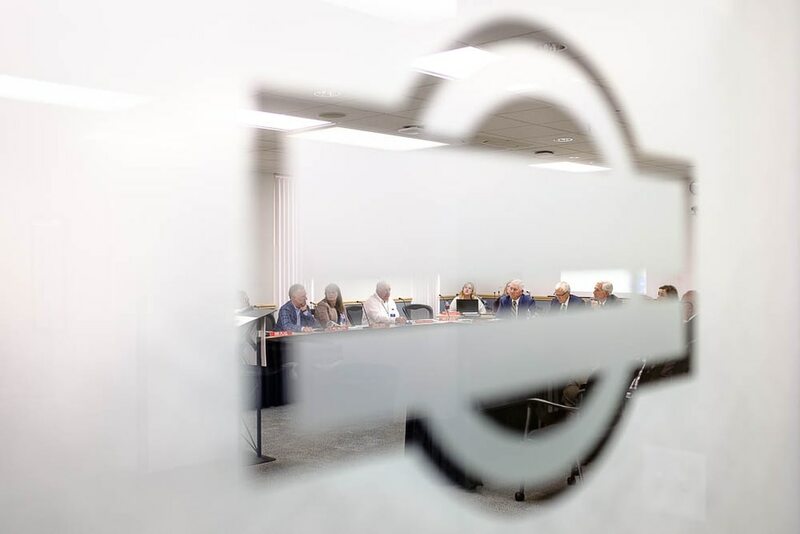 The Utah Transit Authority board that oversaw the rapid development of an extensive light-rail and commuter train system and expanded bus routes — even as it was plagued by multiple scandals — held its final meeting Thursday before disbanding. The 16-member, part-time board is scheduled to be replaced on Nov. 5 by a new full-time, three-member commission appointed by Gov. Gary Herbert. The change is the brainchild of the state Legislature, which believes the commission will be better able to closely watch the agency criticized for high executive salaries, whopping bonuses, travel and sweetheart deals with developers. Also, the old board was sometimes criticized for closed-door or secret meetings. And under its watch, UTA made a deal with federal prosecutors last year for immunity in exchange for cooperation in an ongoing probe into former board members and other officials over land deals. UTA also agreed to submit to several years of federal oversight. Lawmakers had pushed to change that name in a “rebranding” campaign, but gave up on that because of uproar over a price tag estimated at $50 million. Bell said at the final meeting that the agency has cleaned up operations through a variety of reforms and personnel changes since 2014, when it was criticized by an especially scathing state audit. (Trent Nelson | The Salt Lake Tribune) Board Chair Greg Bell and Interim Executive Director Steve Meyer at the start of the final meeting of the current UTA Board in Salt Lake City on Thursday Oct. 25, 2018. After scandals, the Legislature restructured the agency. And the current 16-member, part-time board is about to be replaced by a new full-time, three-member commission by Nov. 1. At left is Jeff Agerson. “I can tell you there isn’t corruption. There isn’t — on any large scale that can be visible — any fraud, waste or abuse. We have cleansed our processes so thoroughly,” he said. Bell added that the board leaves a strong agency, and “we have created a backbone for Wasatch Front growth” with its bus and rail system. Despite controversies, Necia Christensen, who served on the board for 19 years, said, “UTA has been in excellent hands. ... The board has done its best.” She added, “We will always have pride when we see the bus move down the street or the train move people we love,” noting UTA was twice named the best large transit system in North America. As the board adjourned for the last time, a room full of UTA executives and workers gave it a standing ovation. 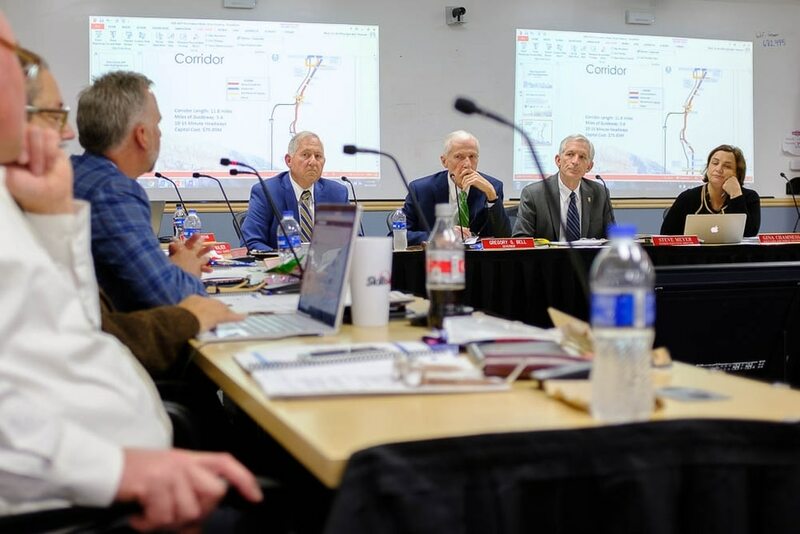 The outgoing board spent its final session approving contracts to launch a study for a new $75 million bus rapid transit route between southern Davis County and Salt Lake City, and endorsing a budget for next year that will grow by 12.7 percent — up from $403.1 million to $454.2 million, thanks to a new sales tax hike for transit in Salt Lake County. One of the first jobs for the incoming commission will be to review and possibly tweak that new budget — which proposes to spend a quarter of all money to pay interest on its $2 billion debt, incurred in recent decades essentially as a mortgage to accelerate building its TRAX and FrontRunner rail systems. Criticism of that large debt is among reasons why lawmakers chose to restructure the agency. Debt service is UTA’s single-largest expenditure, costing $119.1 million next year. The next biggest expense, at $104.6 million, is for bus operations. (Trent Nelson | The Salt Lake Tribune) The current UTA Board says the Pledge of Allegiance to begin its final-ever meeting in Salt Lake City on Thursday Oct. 25, 2018. After scandals, the Legislature restructured the agency. And the current 16-member, part-time board is about to be replaced by a new full-time, three-member commission by Nov. 1. The proposed budget did ignite one final controversy among members of the outgoing board. A few did not like that it proposes to give the incoming commissioners the full $150,000 salary allowed by state law — and complained that the overall commission budget will be $1.4 million compared to the $500,000 spent annually by the current part-time board. Still, members endorsed the spending blueprint on a 7-2 vote. The incoming board is also beginning with its own controversy. The governor has appointed only two of its allowed three members — Carleton Christensen and Beth Holbrook — and is in a tug-of-war with Utah and Tooele counties about a final appointee. Paul Edwards, spokesman for Herbert, said that the governor refused to appoint either of the two nominees sent by the two counties for that seat, and asked the counties to send more nominees. The Utah County Commission is arguing that Herbert by new law must appoint one of the people it nominated, and has refused to send more names. As a result, Herbert and commissioners are in a standoff to see who will budge. In the meantime, approval of any action by the incoming commission will require agreement by both commissioners appointed so far.